Infamous for his cunning criminal tricks, signature grotesque smile and fiendish laughter, the Joker has been chilling our spines ever since the release of Batman in 1966. The role has been played by various actors, some of whom have perfectly brought out the character of the impractical joker. Embodying the original character of The Joker was Cesar Romero in the 1966 Batman series. The first face of The Joker, clad in a purple suit with his painted white face and thin Latin lover mustache, presented a more cunning version as opposed to the devilish psychotic criminal we see today. Critics have said that Romero, in this role, portrayed a childlike kind of mischief. The mischievous Joker on the Batman TV series together with other villains turned their enemies into a colorful pile of dust – all very innocent and child-friendly. This differs to more recent films where The Joker carries out more ruthless and deadly pranks. It seems that over time The Joker can only grow darker and diabolical. See how Heath Ledger pays homage to Cesar Romero’s Joker in our list of Batman Easter Eggs! Hamill was popular for being the vocals behind the iconic Joker in Batman: The Animated Series. His chilling, infectious laughter and sly remarks were voiced in a number of video games as well. 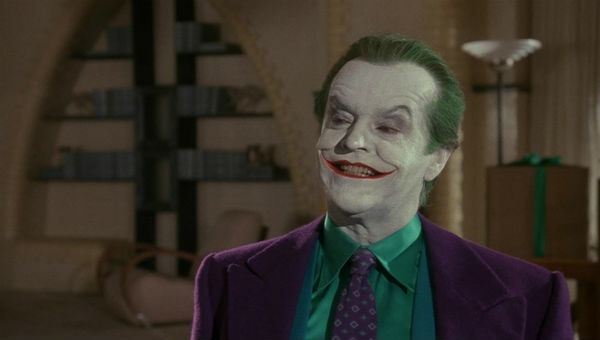 In 1992, Hamill finally made an appearance on television as the face of The Joker. His presence was felt more when he took up the role in 1993’s Batman: The Mask of Phantasm. Hamill’s version of The Joker was playful although seemingly evil. He didn’t exactly portray the capacity to kill. Hamill depicted a more buffoonish image of The Joker to make the act more comical. Since the movie was meant for children, he maintained his tricks to a level that was acceptable for the watershed slot. In comparison to all the other actors who have played The Joker, Hamill was indeed, the funniest. Jared Leto had big shoes to fill following Heath Ledger’s performance but it’s safe to say he did an incredible job in Suicide Squad. In fact, despite his many cut-out scenes from the movie, The Joker stole the show from the actual Squad. Described as a blend of Tony Montana (Scarface) and the Alien in Spring Breakers, Leto’s tatted and thuggish Joker certainly had the psycho factor. Hanging out with mob gangs and wearing expensive tuxedos and teeth grills, this version of The Joker is more likely to be found in a clubhouse than in the traditional fun house as seen in the past. Jared Leto played the part very well. There’s no doubt he’s helped the legend live on. At the time of its release, Batman was greatly applauded in the film industry leading to its crown as a blockbuster movie. Perhaps it was their right move at casting Nicholson as The Joker that propelled the movie to its great status. Academy Award-winning actor Nicholson gave an Oscar-worthy performance as the Clown Prince of Crime. Downing colorful trench coats and fedoras, Nicholas gave the world a scarier version of The Joker compared to the original characters. His poisonous Smilex gas and his thirst to kill the vain in society gave many children nightmares. It’s his giddiness, frightful energy and sinister grin that lands him at the second spot in our list today. For an actor who wasn’t a fan of superhero movies, he gave a hauntingly accurate performance as The Joker in The Dark Knight. Heath Ledger resurrected the spirit of the brutal villain exceptionally, reviving a Joker who was even eviler than his previous depictions. Less cartoonish than his predecessors and a lot more “serious”, menacing and sadistic, Heath Ledger’s Joker isn’t only the best Batman supervillain but possibly one of the best supervillains in film ever. There’s no surprise Ledger won an Oscar for his performance. From his twisted sense of humor, to his iconic laughter and tone of voice, this version of the criminal mastermind has been classed as the best Joker of all time. Simply iconic. Did you know the Joker was almost cancelled out of the comics? Find out why in our list of DC facts and learn more about the comic’s best villain! James has been a writer for over 7 years, having graduated with a first class honors degree in communication and journalism. Over time he has mastered the art of blogging and has interests in reading, watching movies, working out, and photography.